Maybe too good! But how can you resist a booth full of beautiful old tools? The day's haul. 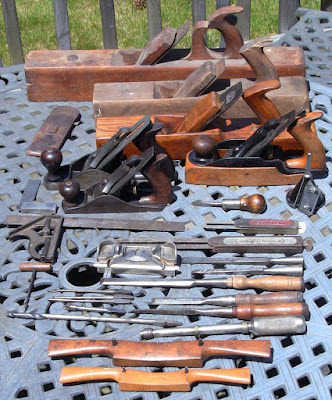 Starting at the back, the planes: wooden jointer, jack, and razee jack; Stanely 35 transitional smoother; spare iron and chip breaker; Stanley #3 and #2. The rest: Starrett engineer's square; small reversible ratcheting screwdiver; spoke pointer; Starrett #94 combination square; Stanley unknown model and #18 bevel gauges; Stanley #79 side rabbet plane; assorted mortise and bevel-edge socket chisels; assorted gimlet bits; Yankee #41 push drill with 7 bits; and two wooden spokeshaves. 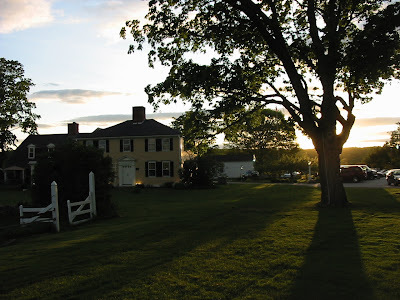 Brimfield is a huge antique show that takes place in Brimfield, MA three times a year for a week. It's a sprawling mix of high-end dealers and low-end flea market junk. You can't cover the 21 different fields in a day. There must be hundreds of booths. My wife and I managed maybe a third. I found three booths with really good selections, two of them approaching Patrick Leach level. Then two more with moderate selections. The rest of the stuff I found one at a time slogging through it all. I saw one wooden jack being sold as a planter (complete with plant in the mouth), and a chair made of saws welded together. No painted saws. This trip, I was on a mission. There's a thread on the Sawmill Creek Neanderthal forum on the challenge Adam Cherubini's issued in his blog regarding using wooden planes. 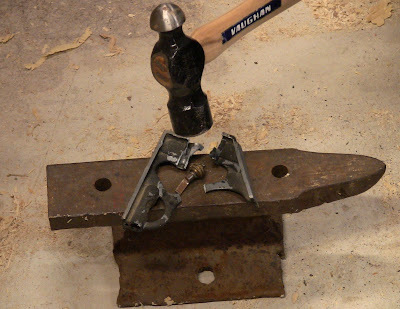 I was preparing to take the challenge, but discovered the iron in my recently-acquired wooden jack had been ground down almost to the chipbreaker slot. No way could I camber it to the degree required for heavy stock removal. So I was looking for another jack or a replacement iron. I was also looking for bolstered pig-sticker mortise chisels, but the only one I found all day was wider than I wanted and more than I was willing to pay. At least the planes were a success. I was very happy to find the two Stanley bevel gauges, because they lock at the base. This is much easier to set than a screw or cam lever at the pivot. I was also happy to find another Yankee push drill. These things are great for small fast holes. And the spoke pointer? Ummm, it's cool? The Stanley #2 was the one real indulgence of the day. It cost as much as most of the other stuff put together. Illustrating the price premium once you get smaller than #3, the #2 cost me five times as much as the #3. Do I really need it? No; if I need something that small for smoothing, I can probably do the job with my #18 block plane. 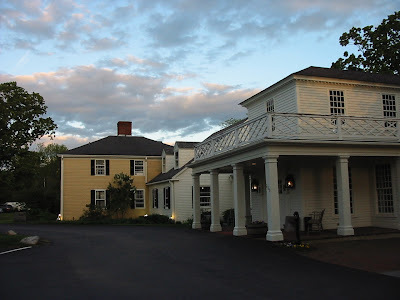 After a long day in the sun, we headed to The Salem Cross Inn in West Brookfield for dinner. They had been handing out flyers at Brimfield. It's a beautiful place on beautiful grounds. The only problem was that it was also U Mass graduation day, so they were overwhelmed with people. But the food was excellent and the service was cheerful if a bit harried. Side view of the Inn. 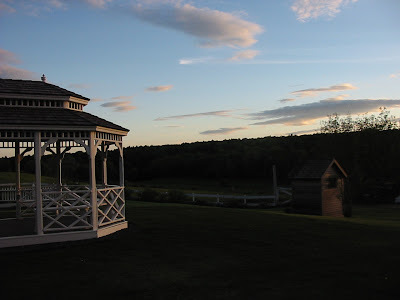 The gazebo, leading out over the field to a farm in back. 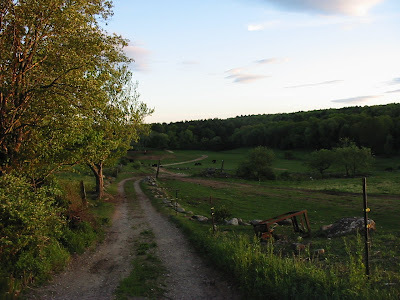 Down the lane to the farm. 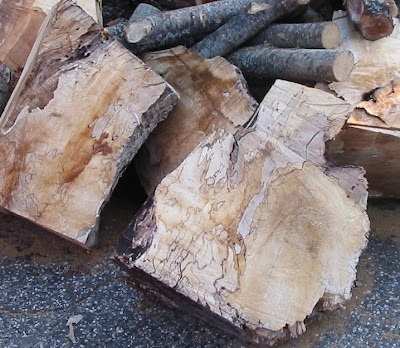 I found this lovely spalted burl at the end of their woodpile. Hopefully, since they've ripped it down to see the spalting, someone has some nice plans for it, not just burn it. This morning I checked the Starrett combination square. There's a reason Starrett has a reputation for perfection. It's because they are. 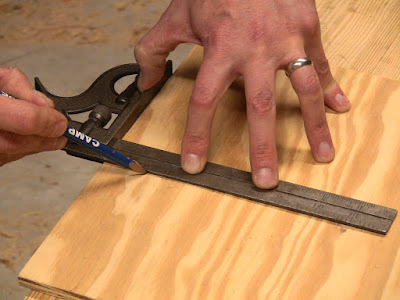 Draw a line on one side with the square against a straight edge. Flip the square and draw another line next to the first. If they're parallel, the square is true. My no-name combination square fails the test. Notice the lines converging at the right end. Looks like you found quite a few items in very good condition. 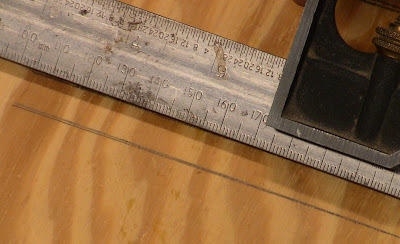 Most of the wooden jointer planes I have seen recently were pretty badly cracked. Although I have a pretty small set of selected tools I actually use, I could not pass up a Starrett double square for $4. I tend to give those things away to relatives and friends. 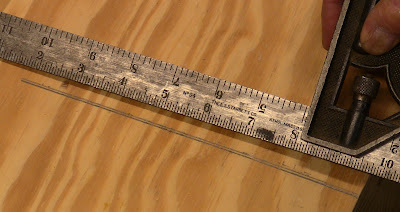 It seems the typical finds vary a little from region to region, here in the Midwest machinist tools are frequently seen at fleamarket, socket chisels are a little harder to find.